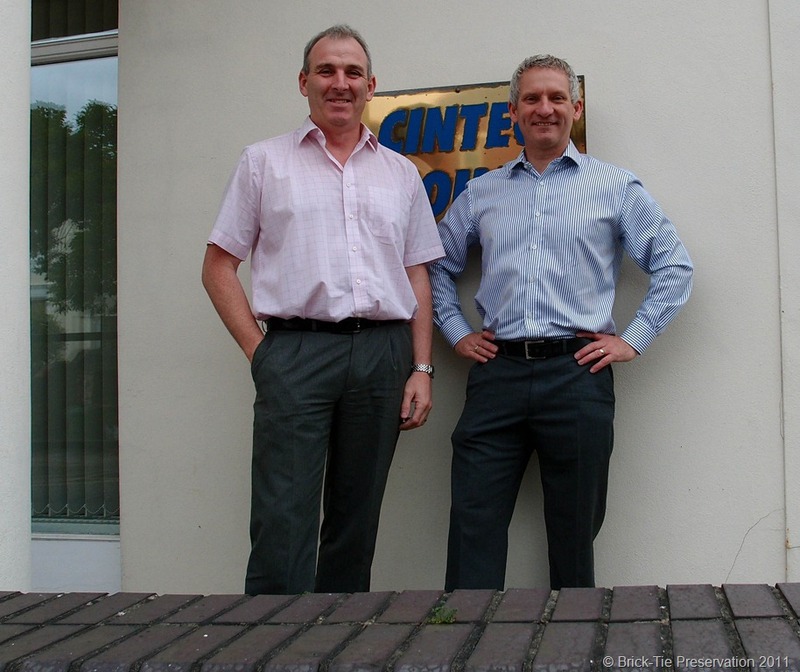 Last week I had to chance to visit my long term supplier Cintec International, in Newport, Gwent. My structural repairs company has a very large contract for installing their advanced grouted anchor system, in the second HM Prison we’ve worked on in two years. The Victorian era prison suffers from weakness in the parapet walls and engineers have specified anchors varying between 700mm and 4000mm long. They are multi-sock anchors, allowing for remote grouting before tensioning to 25KN. After initial curing, using Cintec’s fast setting Prestec 2000 grout, final inflation fixes the pre-tension in place for good. Installed in over 250M of 50mm diameter holes, it’s been quite a diamond drilling job for my Leeds based team. Anyway, the trip to Newport was the first chance I’ve had to actually see people I’ve spoken with many times, over the phone. Cintec project managerAlistair Barbour, showed me around and gave me an introduction to some of the exciting new products they are working on. Despite being a Cintec approved contractor for 20 years, I’d never seen much of the other stuff Cintec produce, (other than wall ties and structural repair anchors); such as their earthquake resistance systems or their blast mitigation products; the Waterwall system is amazing. The company is first and foremost one of free thinkers, with a constant inventive buzz about the place. I imagine the Google campus is full of similar folk. Alistair was excited at the opportunity to show off some of Cintec’s ground-breaking ideas and is right to be enthusiastic; how these inventions get turned into complex and bespoke manufactured products is fascinating and a real example of clever industrial research and product development. No wonder they have won so many award for excellence and innovation. What really counts though, is results. Since 1984 Cintec have expanded out from Newport with operations all over the planet. I know that the structural and civil engineers I deal with in and around Yorkshire are pleased to rely on Cintec anchors (and my guy’s installation expertise) and it’s the same for the rest of the country, but now Cintec really is a global company; Alistair proudly explained how their stitching ties are being installed in the Egyptian pyramids and sites across Asia and the Americas too. Most of the anchors I specify are fairly small items, acting as wall ties, lateral restraints or stitching anchors; in rubble filled walls here in Yorkshire and Derbyshire; Barns, listed buildings, mills, retaining walls and the odd Church. However, now and again we get to order specials, several metres long; our record in Leeds is 6M of full length sock down a 300mm section wall. Ties at 4M long are quite common though and recent jobs like these include Robert’s Park in Bradford, Victoria Mills in Shipley, Riber Castle and of course the Prison my chaps are working on now. Large or small, the technique is the same; install whatever body size is needed in a hole of the right length and diameter and then the clever part, which is to encapsulate the anchor in a grout which will last and most importantly won’t shrink. Cintec achieve this with their clever sock system, which manages the grout so that it flows where it is needed and is not lost in voids. Combined with their Prestec grout range – it’s bloody brilliant and has revolutionised the tying and stitching of rubble. hollow and soft masonry. Key though, is reliable specification and installation and that’s where I get to play my small part in Cintec’s success. Whereas some specialist materials manufactures tend to want to sell volume and are not that bothered about the end result (see the recent flurry of on-line ‘cheap’ wall tie and masonry strengthening web sites); Cintec are very protective of the reputation they’ve earned. Only their own approved contractors can buy and install Cintec anchors. This means Cintec have a measure of control on the finished job and it’s why they back this with guarantee liability cover on the finished projects. This protects them from damaging failures outside their control and assures clients that the performance of the anchors will meet expectations – there’s no chance of that age old get-out clause being used: “Well it’s not our fault – your ‘specialist’ installed them wrong”! Apart from the excellent product, this assurance of competent site installation is a compelling reason for engineers and surveyors to specify Cintec for structural repairs. The trip to Newport was well worth the effort. Thank you Alistair and keep up the good work.